Caution: Scenery- and work-project-heavy post ahead. 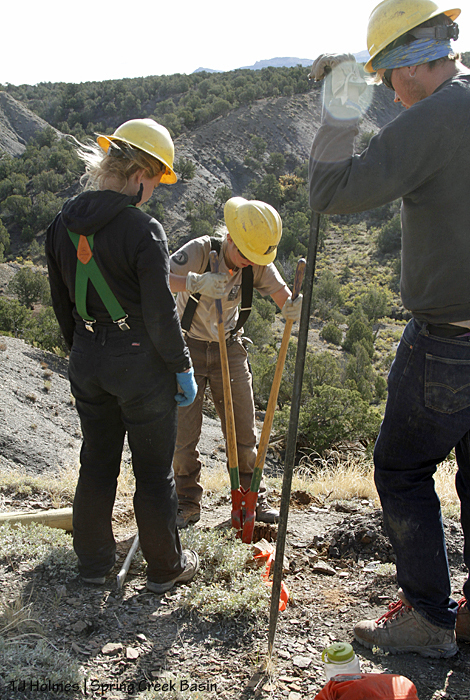 Thursday was the last day of work for the SCC crew – a short amount of time for a big – steep – job. The day started with some clouds, cleared to sunshine, then returned to clouds. (More) Rain started Thursday night. (Have we been blessed by rain the last couple of weeks or what?!) 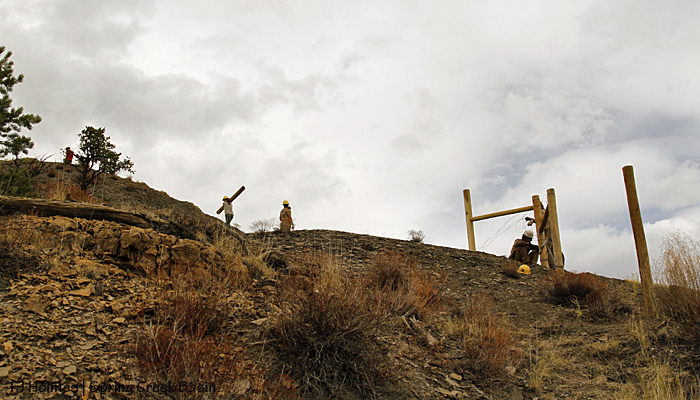 So the crew had good conditions for their final day of work on Spring Creek Basin’s southeastern boundary fence. Let’s start with a scenic overview. 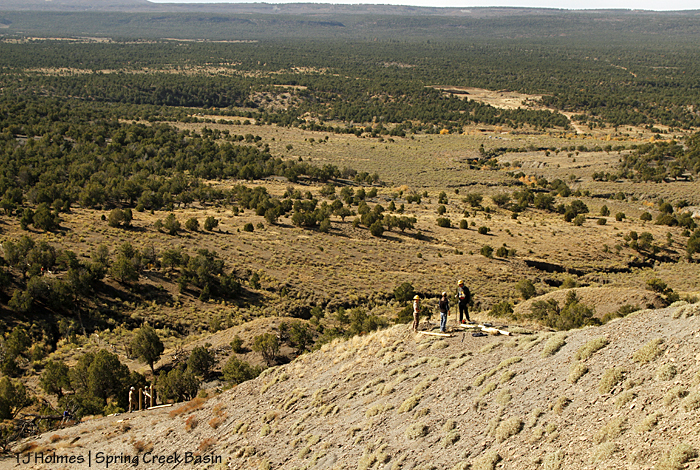 There we were, on the basin’s far southeastern boundary looking southwestish over the basin’s “last” drainage toward Disappointment Road, the cottonwoods along Disappointment Creek and to more pinon-juniper covered BLM land beyond the basin to San Juan National Forest Service land to the horizon. 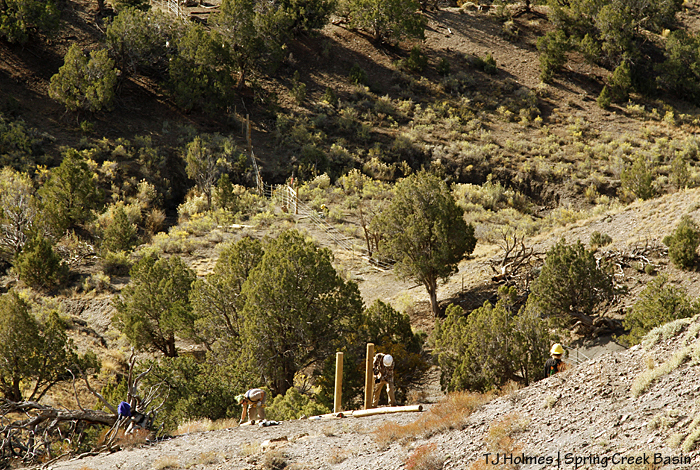 Note the two groups, both working on H-braces on the near ridge – aka “the steep hill.” If you click to make the photo larger, you may be able to see the silver fence at the left; that’s the part of the fence that the crew already had rebuilt. It runs into the fence rebuilt by Mizzou students (we left a section for the students to work on in the spring). Next, let’s take a look at the sad old fence that serves as an example of what the Mizzou students and the SCC crew have rebuilt and are rebuilding. We figure that fence has been around for 40 or more years. 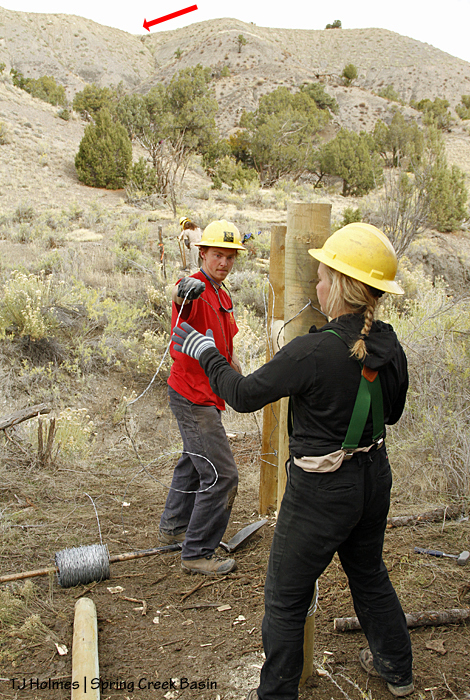 Toby and Zoe tighten another wire strand to a corner H-brace. Their rebuilt fence comes in from straight ahead, up from the arroyo shown in the previous post; the steep hill starts steps to the left. 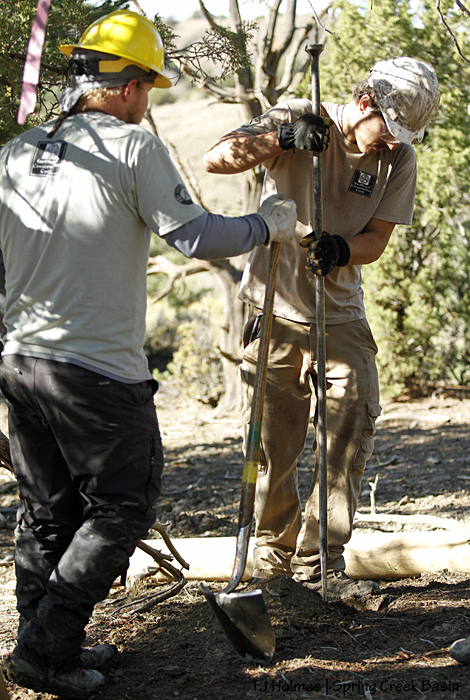 Meanwhile, up the steep hill (hey, it really IS steep), Aaron and Eric dug holes for another H-brace. 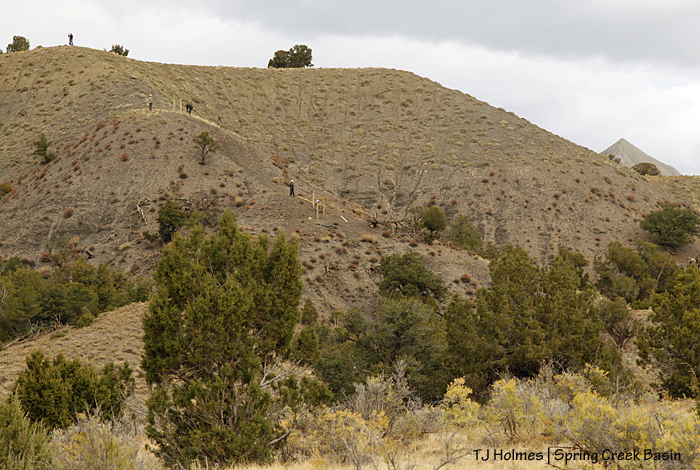 If you look closely, you can see the H-brace Toby and Zoe were working on below the hill at right. Photographic proof of the steepness (in a two-dimensional photo, it’s hard to convey just how steep this hill is): Sarah carries a post up the hill to the site of the next H-brace. 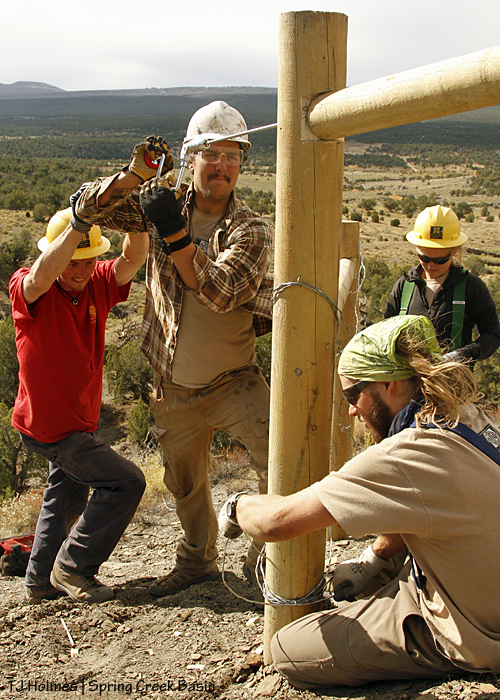 This photo does double duty: Partners Eric and Aaron measure the setting of an H-brace post with the cross post, AND you get another dose of scenery. Toby and Sarah stand ready as Abby uses the post-hole digger to dig yet another hole for yet another H-brace on their journey to the top of the steep hill. Eric and Aaron in the photos above are below on the hill. 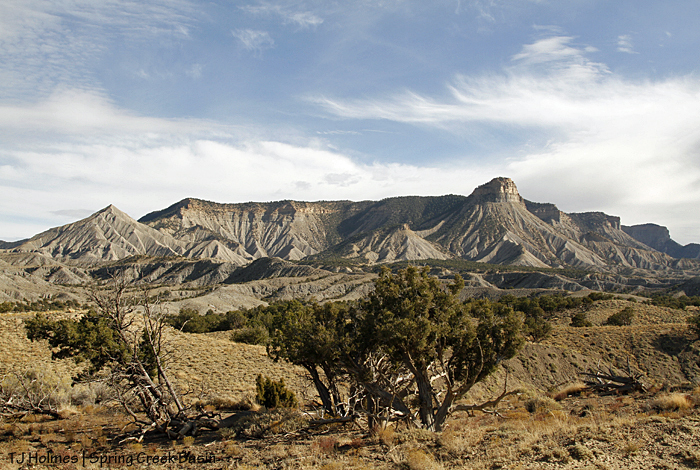 The scenery here is part of McKenna Peak Wilderness Study Area – which overlaps into Spring Creek Basin Herd Management Area; in this view, it’s all wilderness study area. 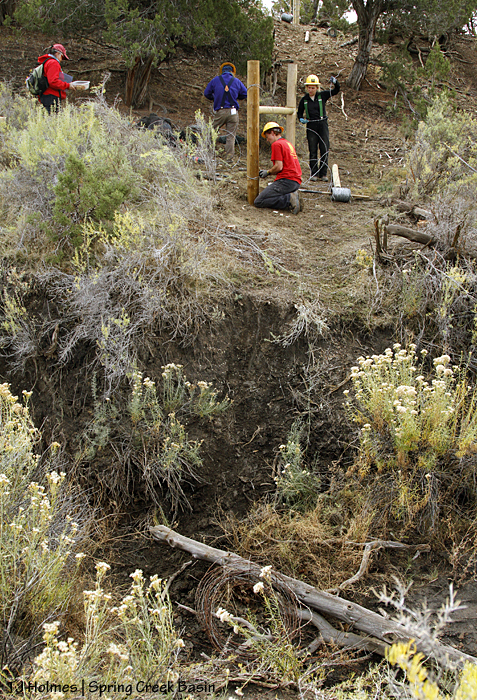 Another view of the same H-brace site, this time with BLM range tech Justin Hunt helping to dig the second post hole. How steep is the hill? The H-brace Eric and Aaron are working on is 100 yards or less below this site – and completely out of view of this little knob in the hill. From the side, here’s a view of Eric’s and Aaron’s H-brace. Abby and group are up the hill to the right. In the very first photo in this post, you can see both groups. 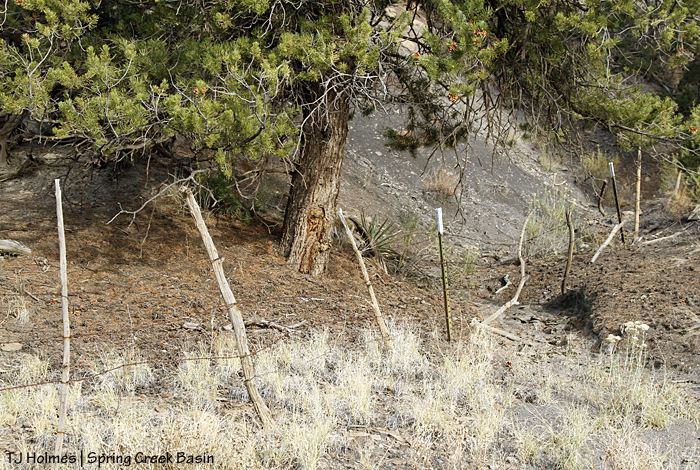 Their rebuilt fence as it crosses the arroyo is very visible in this photo. Another gratuitous scenery shot – ain’t it grand? 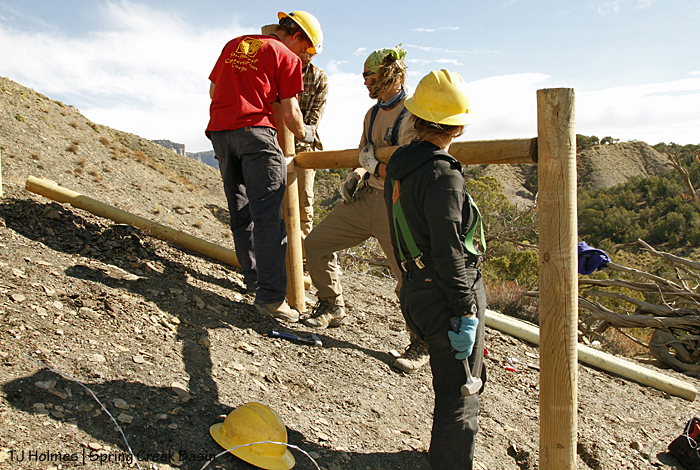 Returning to Eric’s and Aaron’s H-brace, now they have help from Sarah and co-crew leader Dillon to mark the first cross post. We had some debate about the levelness of these cross posts because the ground is so steep. Keeping the cross pieces strictly level would have had the post normal height on the downhill side of the brace but only about mid-thigh high on the uphill side! So crew members mirrored the slope a bit and cut their notches to reflect the angles of the posts’ ends. 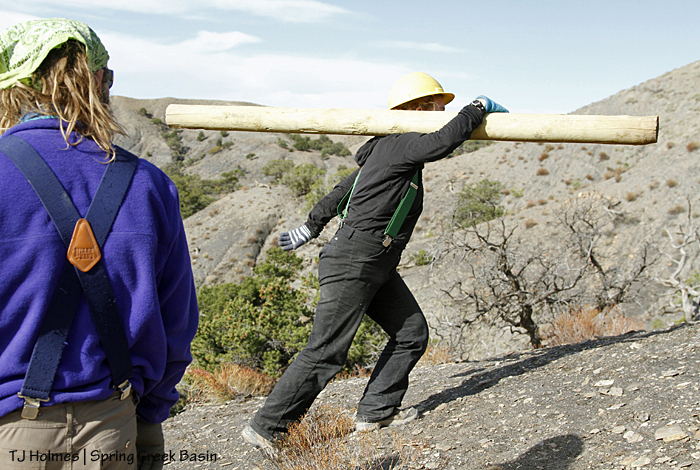 It’s easy to ramble on about the partnerships we enjoy for the benefit of the basin’s mustangs, but here it is in living color: Dillon lends weight to Eric’s drill while he drills a hole in the H-brace into which he’ll later pound a spike. Ain’t it grand?! 🙂 Wrapping wires to create the “X” to further bind the brace posts together are Aaron and Sarah. 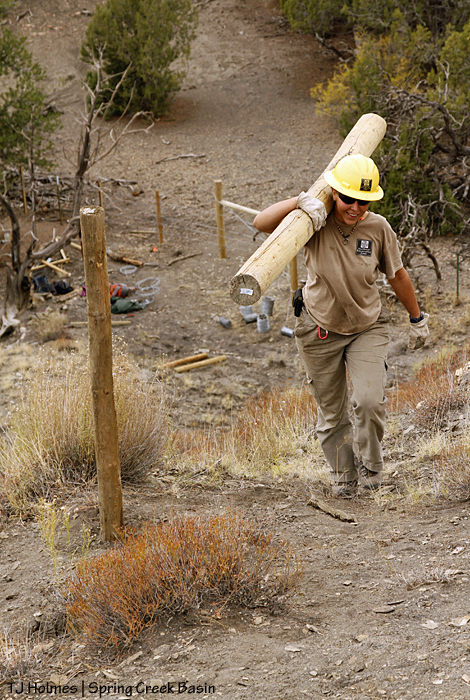 Sarah chips out the notch that will hold the cross posts even steadier in the vertical H-brace posts. 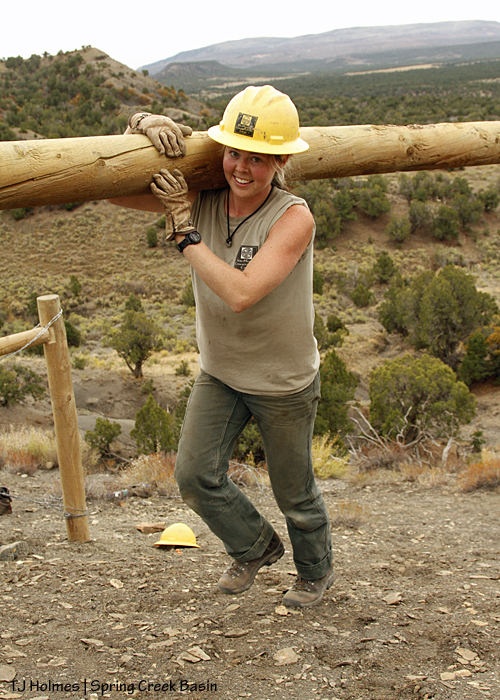 Co-crew leader Sarah carries an H-brace post up the steep hill. She’s passing the first H-brace, and she’ll pass the next H-brace before getting to her destination – and they had at least one more H-brace to build after that. Still all-smiles on Day 4! Justin follows Sarah on the way to the second H-brace up the steep hill, where Dillon is making cuts to start the notching process. And here’s Zoe carrying another post from basically the base of the steep hill (scroll back up to the beginning of this post and the H-brace where she and Toby were tightening a strand of wire). From the bottom looking up. And from down toward the arroyo looking up at the steep hill. Um, wowowow?! 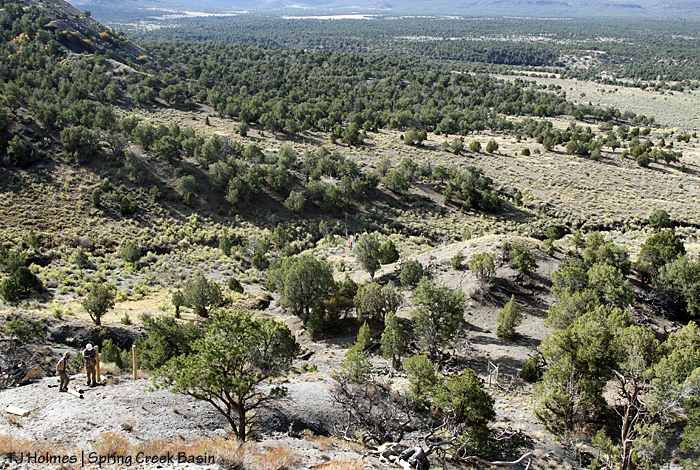 The wilderness study area’s namesake McKenna Peak shows its point at far right. Sarah, Dillon, Eric, Aaron, Sarah, Zoe, Abby and Toby, we thank you, thank you, thank you for your service on behalf of our mustangs! We hope your last hitch of the season was your best. 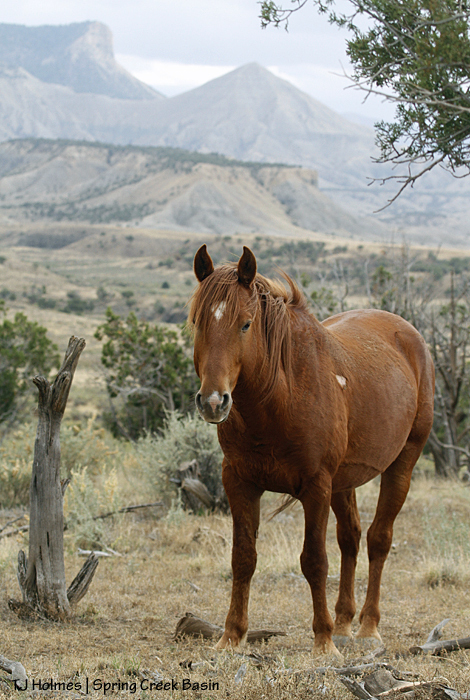 Thankfully, you saw some mustangs along the way between camp site and work site, and if you can, please come back soon to see more of the mustangs protected and kept safe by your work! Right here, this is the reason (OK, one reason) we love SJMA‘s Kathe Hayes: She brings homemade chocolate-chip cookies as mini mid-work thank-yous! 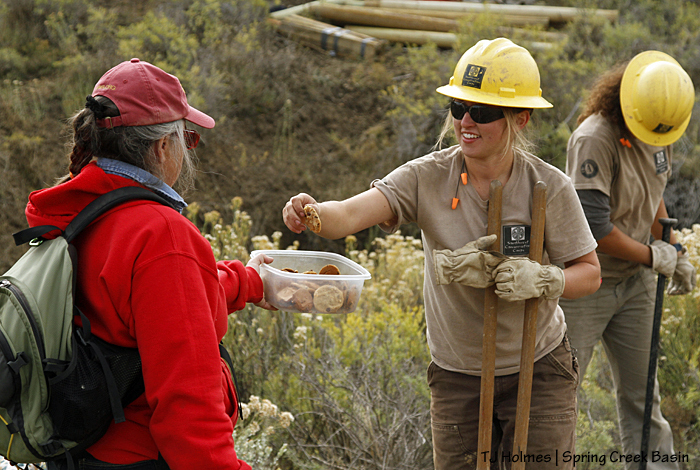 Here she offers cookies to Abby as she and Zoe dig post holes for the next H-brace in the SCC crew’s brand-new fence section. 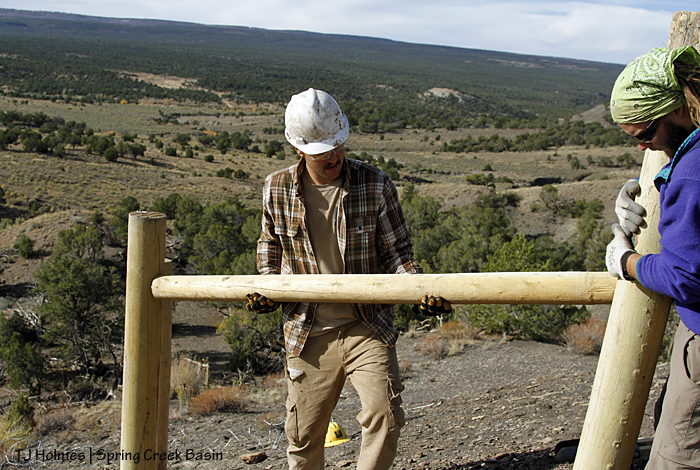 The crew has made excellent progress in their section of fence line – building five H-braces since Monday and working on the sixth as of the above photo. 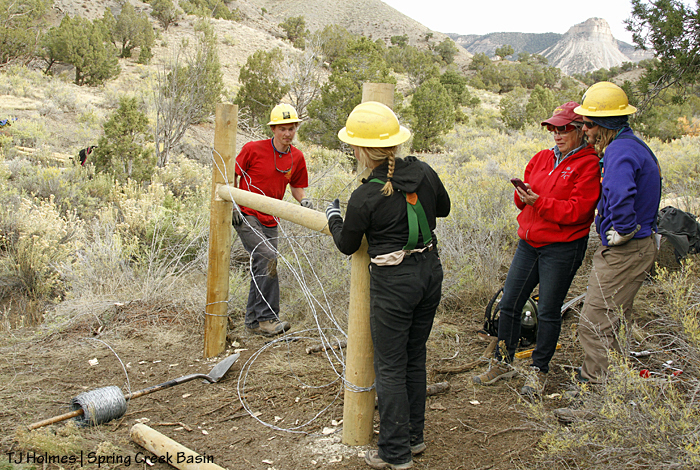 In the foreground, Abby and Zoe dig post holes for the next H-brace, while in the background, Aaron and Sarah and co-crew leader Dillon complete the previous H-brace. 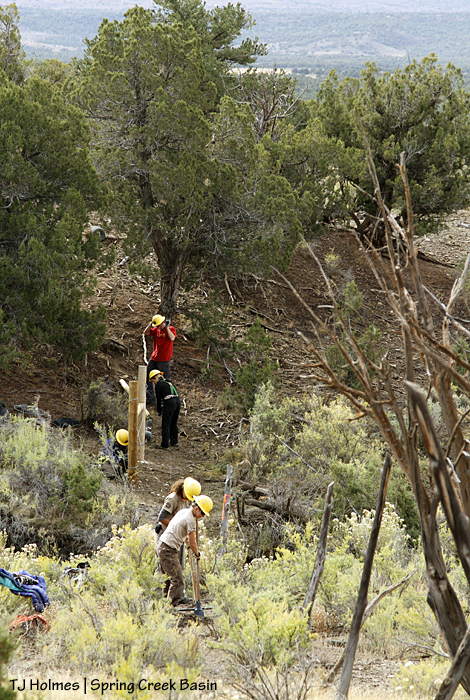 Harder to see is the little arroyo – no more than a few feet deep but steep-sided – between the two groups. Here’s a closer look at the arroyo. Note Kathe in the background, approaching with her awesome cookies. Kathe shows Aaron photos of the pack horses that hauled fence supplies to the work site a few weeks ago while Sarah and Dillon finish their H-brace. Temple Butte watches over the crew from the background. 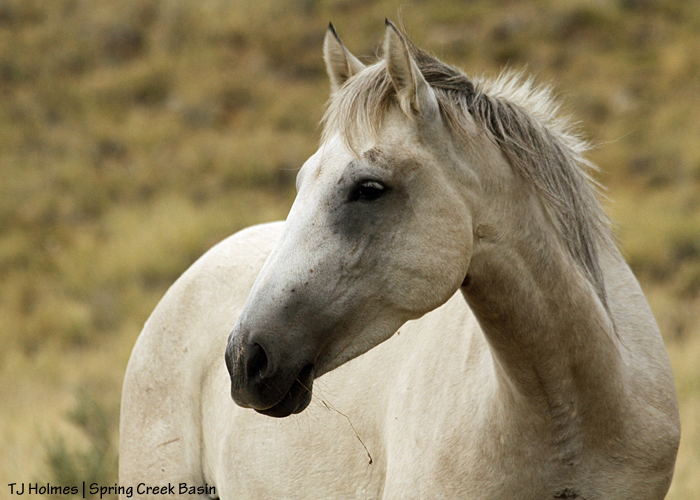 Here in Spring Creek Basin, we are incredibly lucky to have the benefit of multiple partnerships that work for the well-being of our mustangs. 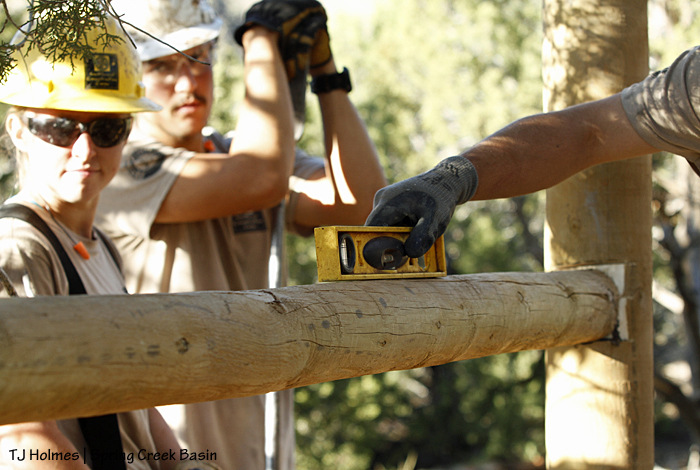 Our newest partnership is with Southwest Conservation Corps, based in Durango. 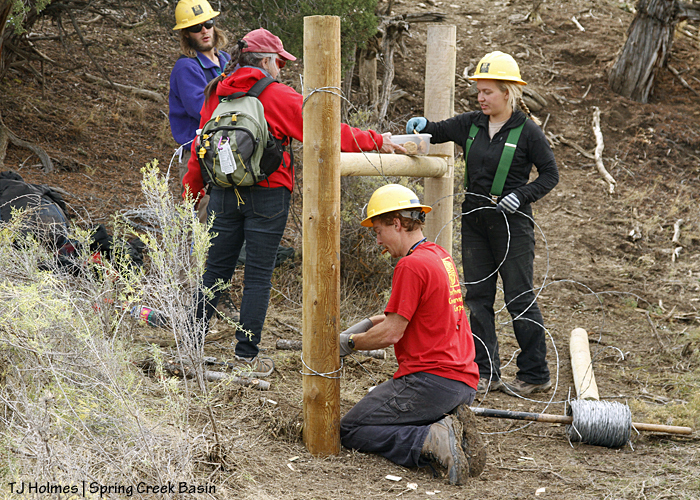 Thanks to the diligence of San Juan Mountains Association‘s Kathe Hayes and Tres Rios Field Office range specialist Mike Jensen, we have an SCC crew tackling an especially difficult section of fence: across an arroyo and up a steep, shaley hill. 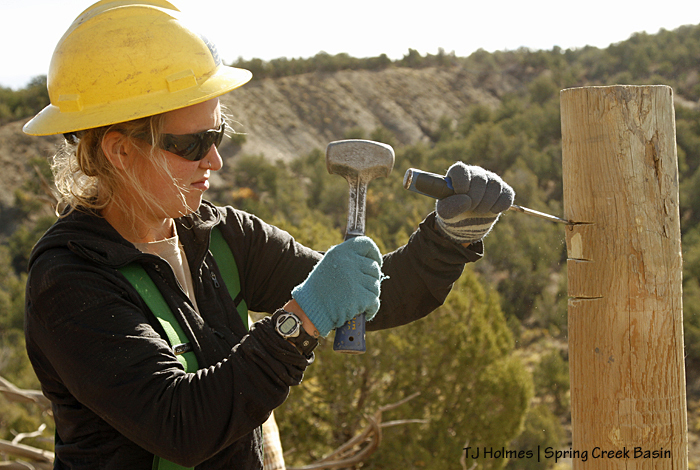 Long-time readers know about our wonderful alternative spring break program with University of Missouri students and that, for the last four years, students have been rebuilding the basin’s southeastern fence line. 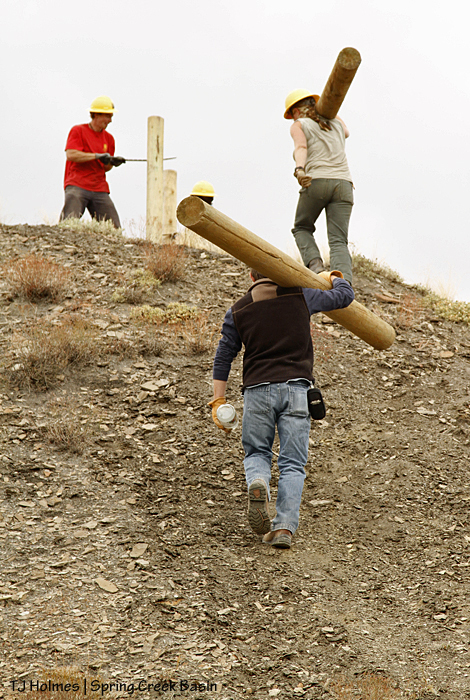 The SCC crew, which has spent the summer building trails, building fences and planting trees, is jumping ahead a bit to the steep section. 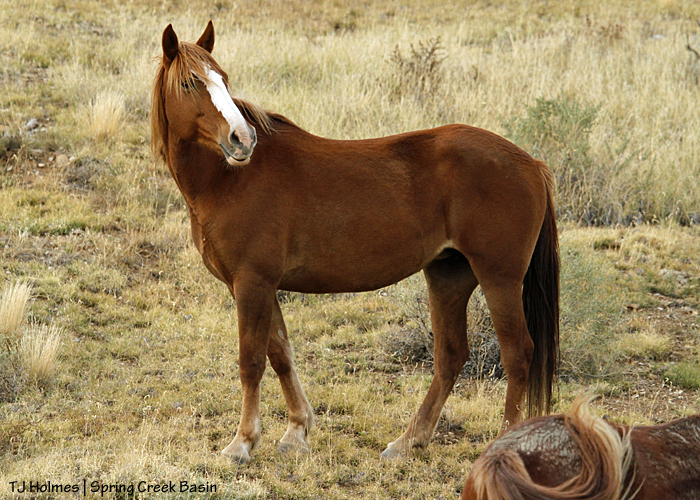 As we are with every bit of help that comes our way for the benefit of the mustangs, we are hugely grateful for their work! 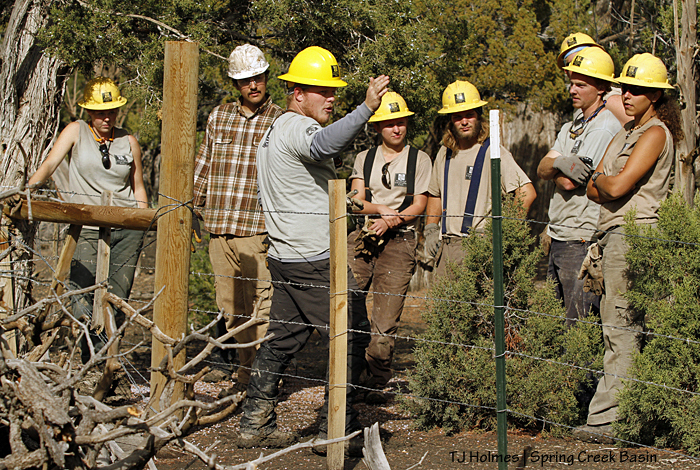 Jordan explains previous fence building by Mizzou students to SCC crew members, starting the first day of their hitch in Spring Creek Basin. Mizzou students and BLM employees and volunteers have set the bar high with the new fence! From left: Sarah, Eric, Jordan, Abby, Aaron, Toby behind Dillon, Dillon and Zoe. 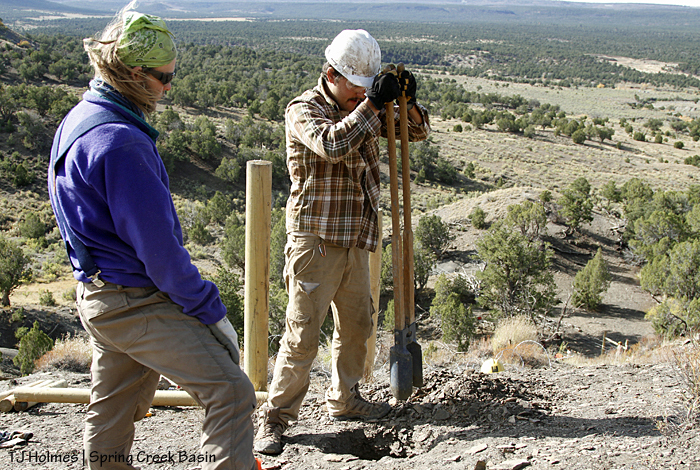 Jordan stands by with a shovel while Eric digs a post hole for their first H-brace. 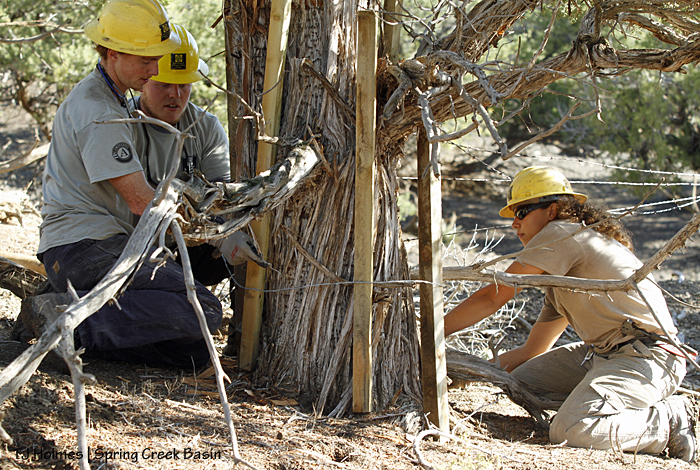 Co-crew leader Dillon helps Jordan and Zoe protect a tree with staves around which to wrap wire. The Mizzou students this spring ended their two days of work with an H-brace on the other side of this tree. 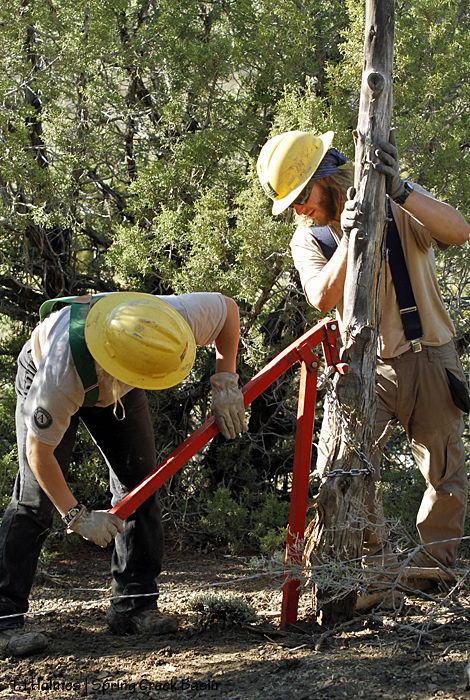 Crew members Sarah and Aaron work together to pull out an old fence post that had a rotten bottom from being in the ground for who knows how many decades. 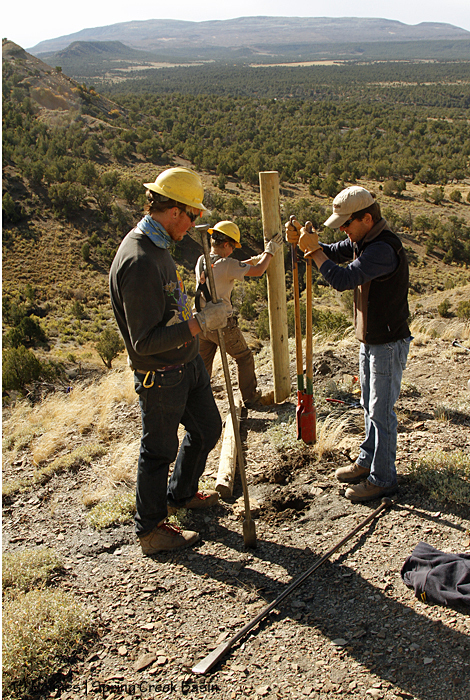 Crew members Abby and Eric, who helped dig the hole for the H-brace post, watch as Dillon checks the level of the cross post. 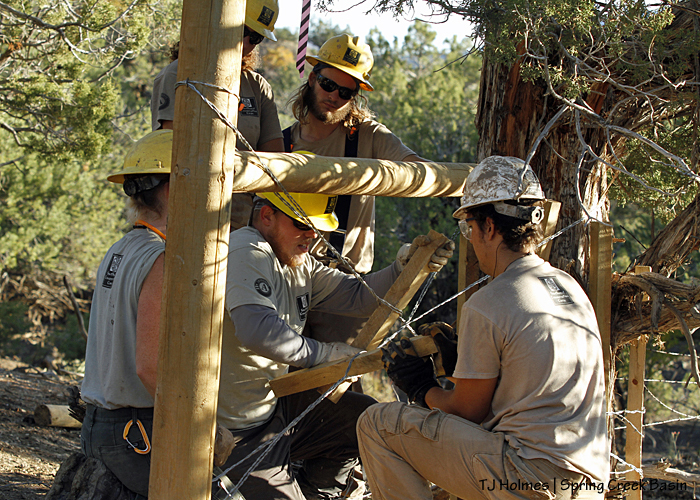 Co-crew leader Sarah (there are two Sarahs on this crew) and crew members Toby, Aaron and Eric watch Jordan show them the twisting technique of the staves in the cross wires that bind the H-brace together. 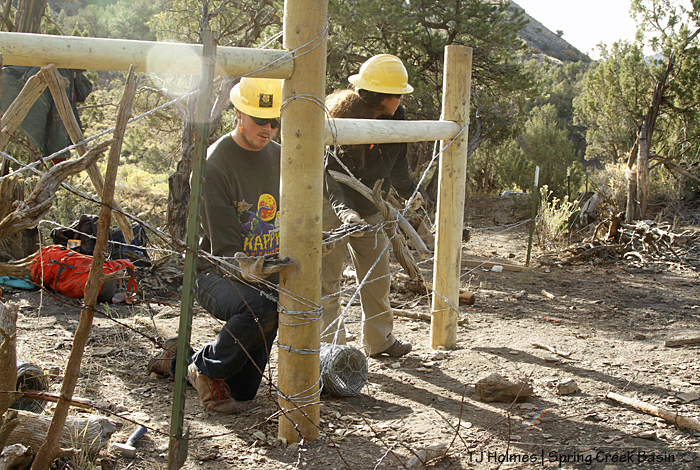 The crew finished the H-brace and strung strands of wire on their first day of work … which started with about a quarter of an inch of rain! As you can see, the day ended with beautiful sunshine. One of the coolest part of the day? Seeing the pintos as we drove to the work site and again as we returned to the camp site. 🙂 The horses are the reason for the work, the partnerships … the tramping through mud carrying heavy posts and fencing tools. They’re absolutely the reason we do all that with smiles! Handsome red boy Hayden relaxes in front of a wondrous Spring Creek Basin background – Knife Edge, McKenna Peak and Temple Butte. We are so blessed with our mustangs and our landscape! Because she’s gorgeous, a closeup of Mysterium. 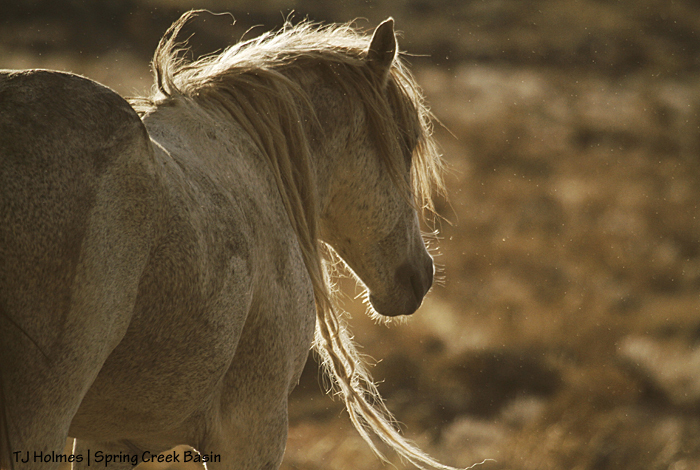 Though she’s young, she seems to carry the wisdom of the ages – and the wild to which she was born. Because that light was dreamy, another one of Chrome. His long(est) dredlock usually hangs on the other side of his neck, but he had tossed his head at some point, flipping the long locks to this side, where, from my vantage point, it caught the light just right as it swayed gently with the movement of his mosey. If you click on the photo to make it bigger, you can see the sparkles of raindrops that were falling, even as we reveled in the shine of the sun. Nope, just a plane. Because of the acoustics of the bowl-like hill the horses were grazing in, the plane sounded like it was about to buzz the treetops above us. It wasn’t really that close, but it wasn’t high-flying, either. Gaia’s reaction is a reminder that the horses don’t forget dangers from the sky, either.